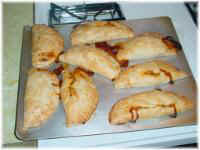 Crawfish Turnover Recipe: This dish is not that hard to do and is a great crawfish dish. Give yourself a few hours. Makes 8 turnovers or pies. This was derived from Emeril's recipe. I wanted to give you a nice detailed view of it. Combine the flour and salt in a mixing bowl. Add the shortening and 1/4 cup of the water and work in by hand until well mixed. Add a tablespoon or so of water at a time and and continue to work the dough until you wind up with a smooth ball of dough. Wrap it in plastic wrap and refrigerate it for about an 1 hour. In a large sauté pan, over medium heat, melt the butter. Add the onions, bell pepper and celery. Season with salt and pepper and sauté the vegetables until soft. "Caution": If you are using crawfish tails from your own boiling they will be seasoned already to a certain extent so be careful with the seasoning. If they're not, you can enhance the flavor by doing this. Click Add the crawfish and cook for another 10 minutes, stirring occasionally. 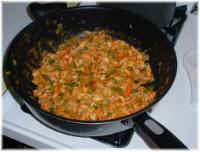 Dissolve the flour in the water and add to the crawfish mixture. Stir and bring to a boil for a few minutes until the mixture thickens. Note: you want to mixture moist but not runny. Add the parsley and green onions and stir. Let cook for a few more minutes and turn the fire off. Now taste it to see what it needs. Cool to room temperature. Let's stop here a moment... if you cook a big Crawfish Etouffee you can use those leftovers to make these. You just have to thicken it up if needed with a little flour. Preheat the oven to 375ºF and lightly oil a baking sheet. 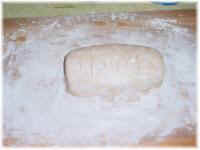 Remove the dough from the refrigerator and place it on a lightly floured board. Form a log with it and make divisions with your knife. 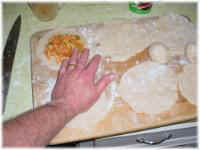 Now, cut the dough into the 8 equal portions. 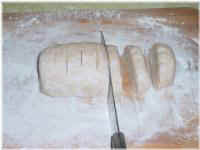 Lightly flour each piece. Using the heel of your palm, flatten each piece 6" round, 1/4" thick. Fill the center of each one with about 1/3 cup of the crawfish mixture. Fill each of them first, then start folding. Brush the inside edges of each with some of the beaten egg. This will be the glue that holds them together. 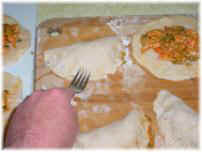 Fold the rounds in 1/2 and crimp the edges with a fork. Brush the tops of the turnovers with the remaining egg. 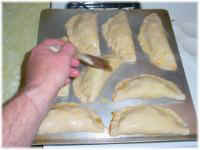 Place the turnovers on the baking sheet about 1" apart. Bake for 45 minutes or until golden brown. Don't hesitate to use this recipe for beef and pork leftovers. If you like these you might also like Crab Bites. Do you have a favorite recipe you would like to post here?